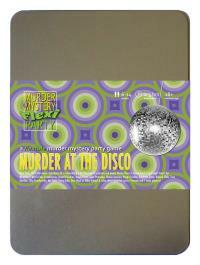 You've been invited to play the role of LARRY GIBB in Murder at the Disco. New York, 1977. Hot nightclub Disco 54 is hosting a birthday and only the coolest people are there. But before anyone can 'get down on it', nightclub owner Doctor Disco is found dead in the VIP lounge! Join us to find out whodunit! Your dress sense is nothing if not unique with gold lamé trousers and matching jacket worn open to show off a bewildering amount of chest hair. Top with blow-dried locks, beard and just a small gold chain - you don’t want to overdo it! Born in England, raised in Australia and living in the United States has given you a very strange accent indeed. You slip into all of them during conversation but prefer Australian. You trained to be a dental hygienist at college but later gave up when you realized you had to work on teeth other than your own. That’s when you decided, along with your brothers, that being a pop star would be quite a groovy career so you formed a band - and the rest, as they say, is history. Hey everyone, I’m Larry Gibb, singer of lots of hit songs I’m sure you already know. Doctor Disco was like a brother from another mother to me. I can’t believe he’s gone. Well, I know he’s probably still lying dead as a duck in the VIP lounge right now, but you know what I mean. I was in the VIP lounge several times today with him, I didn’t notice anything suspicious. Such a great guy… he’d have been awesome at writing songs if he’d ever got around to it.